A few days ago, Ashley Akers published on her blog the first three images of her most recent pieces. In the whole of her work is a remarkable contrast of colors and textures provided by textile materials, polymer, stones and metal. La Ashley Akers acaba de publicar al seu blog les tres primeres imatges que són de les seves peces més recents. En el conjunt del seu treball destaca el contrast de colors i textures donat per la combinació de materials tèxtils, polímers, pedres i metall. This entry was posted by Montserrat Lacomba at 6:47 am. | This post has one response. 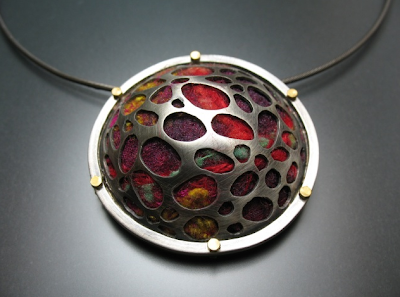 This post is filed under Blog, USA and tagged with Ashley Akers, contemporary jewelry. Thanks for featuring my jewelry!